Your inquiry has been forwarded to Roberson Funeral Home and Crematory. ENOCH KARRER, JR., 91, of Port Charlotte, Florida and formerly of Punta Gorda died Sunday, April 15, 2012 at Tidewell Hospice, Port Charlotte. He was born October 10, 1920 in Washington, D.C. and moved to Florida in 1982 from Beford, Massachusetts. 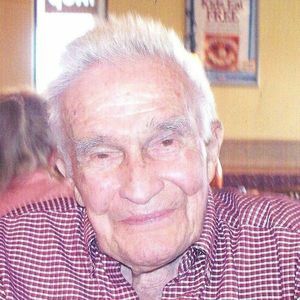 He was a retired aerospace engineer for Raytheon Corp. and a veteran of World War II, U.S. Army and U.S. Navy. Survivors include three daughters, Heidi Schwarz of Westboro, MA, Erika Jones of Groveland, MA and Gretchen Gallant of Hollis, NH; sister, Ethelda Karrer of Oregon; 6 grandchildren and 2 great grandchildren; friend and companion, Pam Comstock of Port Charlotte. Memorial services will be held Friday 2:00 PM, April 20, 2012 at Roberson Funeral Home Punta Gorda Chapel. Further memorial services will be held later in Massachusetts. Friends may visit online at www.robersonfh.com to sign the memory book and extend condolences to the family. Arrangements by Roberson Funeral Home & Crematory Punta Gorda Chapel. Enoch (Eek) and I were classmates at Eastern High School in Washington, DC, in the graduating class of 1938. I had occasional contacts with him after graduation. The most unusual one of these was in September,1944, as a recruit at Great Lakes Naval Training Station in Illinois. I was going the the line for my various immunization shots, and the medic trainee who handed me a cotton swab to wipe the blood off my arm after one of the shots was Enoch. I had no contact with him in later life until 2002, when I tracked him down in Florida. I wrote him a letter, and had one or two phone calls later, but nothing more recently. He and I were of the same age and had mutual friends in high school. My condolences to his family.